Check out the minivan! It’s right next to Danceland. UPDATE: Ever since I posted my minivan photo, my inbox has been going crazy (with emails). Everyone wants to know about the minivan. What’s its name? When did I get it? Is it male or female? So here we go. Thanks, but it’s not mine. 3. Then I don’t care about that minivan. That makes sense. I don’t even know what it’s doing in the photo. 4. It kind of ruins the image. Tell me about it. I thought that it would serve as the punctum to Danceland’s studium, but it just looks like a minivan photobomb. 5. Where were you, even? 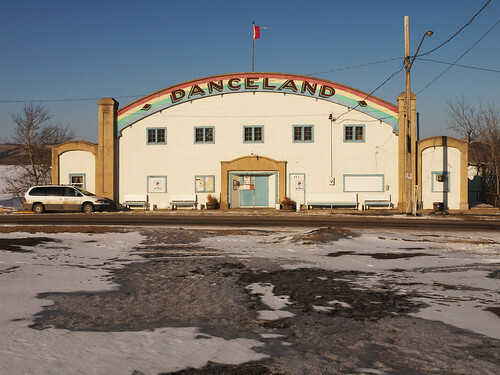 I was at Danceland in the resort village of Manitou Beach. February. Off-season. 6. And there’s a dance hall there? Yup. It’s one of the few left in the world with a floating floor on a bed of horsetail hair. Really. But I think the van’s female.